It’s a thing in blogging, and really in reviewing things on any platform, where you feel you ought to look for the next great new item all the time. That means a constant parade of new random products. I’m not exempt from this feeling, but I’m also very willing to take other peoples’ word for things being good. That means that, while I do try to buy new and interesting products to play with, I also buy things based on the recommendations of others with more influence than myself. Here are some products that I have bought based on recommendations from other bloggers or reviewers, and my thoughts on them. 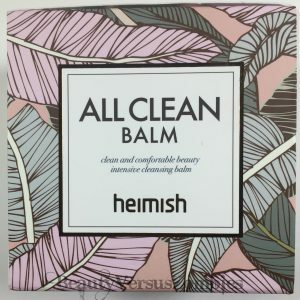 I purchased this cleansing balm based on the recommendation of Edward Avila in this video. He said that the brand Heimish was created by folks who originally worked at Banila Co. 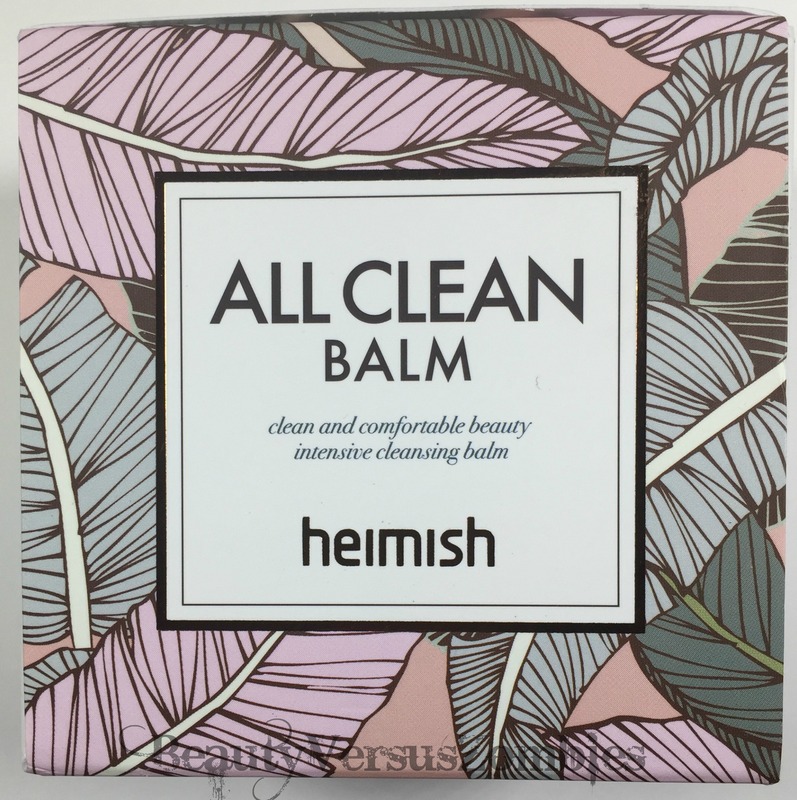 The Heimish balm, according to Edward, is basically a Banila Co. Clean It Zero that doesn’t leave a film behind. Although I’ve never felt there to be an issue with the Clean It Zero leaving a film behind, I thought trying the Heimish out would be worth it. 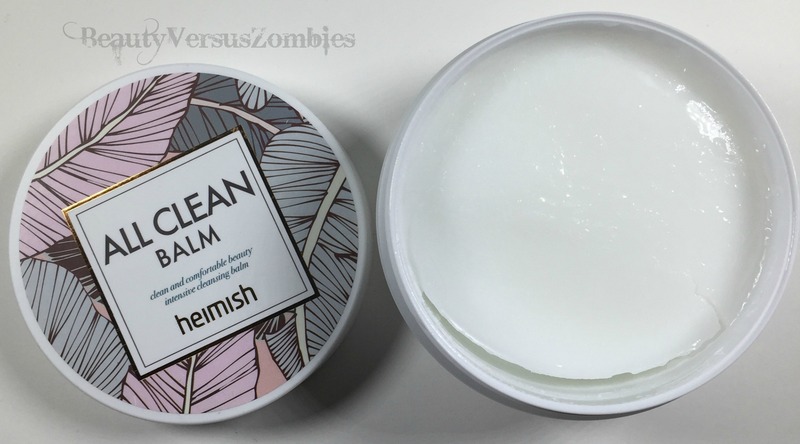 The balm itself does basically everything that Edward claims. It goes on easily, emulsifies like a dream, and washes away clean, leaving skin ready for a second cleanse. Unfortunately for my enjoyment of this product, it smells absolutely awful. If it were any product other than a first cleanser, I would immediately stop using it. After using this for a couple weeks, I ran into two problems that may or may not be related. First: the cap is a screw-on type. This is the same system that Banila Co. uses (and a lot of other brands as well). The issue for me here is that the threading seems to be a little off – I sometimes have to make multiple attempts to get the lid screwed on correctly to get a seal on the product. This may or may not have led to my second problem – it appeared after a week or two of keeping this in my bathroom that some of the balm was melting in the pot. Most of the balm was still in its semihard state, but there seemed to be a puddle of goo in the divot I made in the balm when I took product out. It never really re-solidified, which makes me think that something has gone off with the product. I’m tempted to just chalk the whole thing up to me not properly taking care of the balm by not making sure it had a good seal on the tub, but at the same time I’m not going to take the risk by repurchasing it. Ingredients: Ethylhexyl palmitate, cetyl ethylhexanoate, PEG-20 glyceryl triisostearate, PEG-8 isostearate, butyrospermum parkii (shea) butter, donkey milk, cocos nucifera (coconut) fruit extract, citrus aurantifolia (lime) fruit extract, freesia refracta extract, iris versicolor extract, jasminum officinale (jasmine) extract, lilium tigrinum extract, leontopodium alpinum extract, nelumbium speciosum flower extract, narcissus pseudo-narcissus (daffodil) flower extract, rose extract, citrus aurantium dulcis (orange) peel oil, lavandula angustifolia (lavender) oil, pelargonium graveolens flower oil, amyris balsamifera bark oil, citrus paradisi (grapefruit) peel oil, eucalyptus globulus leaf oil, melaleuca alternifolia (tea tree) leaf oil, juniperus mexicana oil, boswelia carterii oil, citrus aurantium bergamia (bergamot) fruit oil, tocopheryl acetate, 1,2-hexanediol. I’m not sure which ingredients are responsible for the awful smell, which I would charactarize as astringent, medicinal, and herbal. I suspect it’s the boswelia carterii, but I can’t say for sure. I bought this product on Amazon, and it cost $16.41. 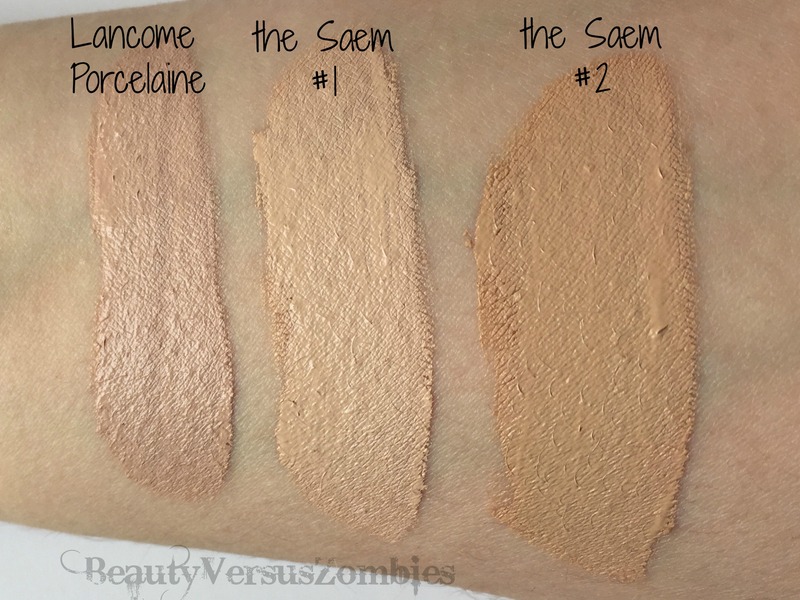 This is a liquid-type concealer with a doefoot wand. 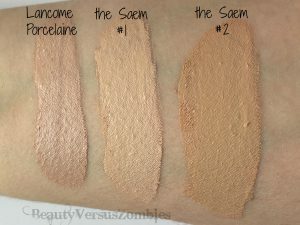 I couldn’t tell online which color would be the best for my skintone, so I picked both # and #2. The product comes in a #1.5, but that was sold out. Here are some color swatches. As you can tell, these lean a little yellow. This product has really good coverage, but unfortunately it’s not great in terms of working on a really mobile area like the undereyes. I will admit that now that I’m getting older I have more fine lines under my eyes (I guess the huge dark circles weren’t enough, thanks face). This product did NOT deal well with them – even from the beginning my undereyes looked a little creepy and unpleasant. Even putting a primer underneath didn’t really help. 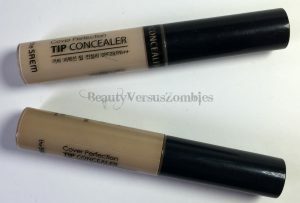 This concealer worked well on other areas that didn’t have fine lines, though – the sides of my nose and cheeks looked great. If I had a concealer that was a little too thick, I think I might try to use this to mix in to thin it a little. I have no trouble with the idea of using it around my nose and on my cheeks as necessary in the future. However, when it comes to my undereyes… this product just doesn’t cut it. If you’re the kind of person that doesn’t have issues with fine lines on your undereyes this might be a winner for you, and to be frank it’s cheap enough that it’s worth trying out. You can purchase this product on Memebox for $6, Amazon for $4.61, or on Koreadepart for $2.71. Son&Park’s Beauty Water made a huge splash (no pun intended, sorry) in the AB community when it was introduced. 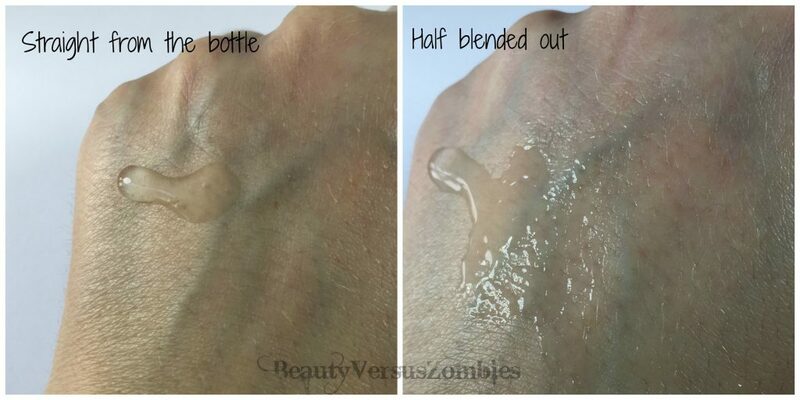 It can work as either a toner or a micellar water (aka makeup remover). It basically looks and feels like you’re just wiping your skin with water, but it claims to cleanse the skin and remove impurities while also lightly moisturizing. I do find that this works decently as a toner, and it’s a good enough makeup remover in an emergency. I can’t say that I reach for it when I’m wearing really stubborn makeup, though. 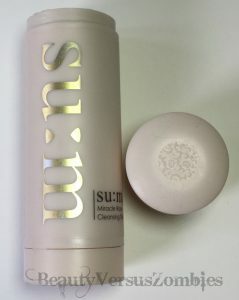 As a cleanser it’s more a last-ditch, ran-out-of-balm-cleanser or too-tired-to-cleanse sort of thing. I do like it as a toner, though – when I’m in between testing things, or trying to recover from testing a toner that my skin hated, this is what I’ve been using. It certainly doesn’t break me out or irritate my skin at all. Ingredients (listed on Sephora’s website): -Willow Bark and Papaya Extract: Renew skin’s surface by lifting impurities and dead skin cells for brighter, smoother skin. -Rose Flower Water, Orange Fruit Extract, and Lavender Water: Deliver intense hydration. You can purchase this product on Sephora, and on SokoGlam, each for $30. Or buy it on Amazon for $23.55. I got mine through a buying service a long time ago. I’ve made it through about 2/3 of the bottle so far. Tracy from Fanserviced and I have similar skin types (oily and acne-prone) so her reviews have a lot of influence on my buying decisions when it comes to skincare. This cleanser doesn’t foam much, and it absolutely feels like it cleans well. Whether it leaves my face feeling a little tight depends really on the rest of my skincare routine and how harsh it is. I found myself feeling like this cleanser was a little too much while I was using my Curology prescription, and I felt the same when I was using a Paula’s Choice BHA routine (which, on a side note, left my skin a disaster). When I’m not being quite so harsh with my skin, it doesn’t seem nearly as intense. You can purchase this product on Amazon for less than $10, on SokoGlam for $11, on Memebox for $10, and on Wishtrend for less than $10, among others. This product is not hard to find; lots of folks really like it. I wanted to put this on the list, even though I’ve actually already reviewed this product here. I absolutely would not have purchased this to try without reading the hype that this stick got all over the place, but especially not without Snow’s review. Suffice it to say, I am still using this as my second cleanser when I’m not using the CosRX cleanser, and it will be the product I pack when I travel. This was actually my first “blogging under the influence” purchase – I was just so excited by Pony’s videos where she was using these that I bought a whole bunch of them. I still have them. I haven’t used any of them up. That isn’t due to any defect in the product at all; I actually still really like them. Since I have to be fairly conservative in my work appearance, I just can’t wear the more interesting eyeliner colors on a daily basis. I reviewed a holiday release set of Play101 pencils here. 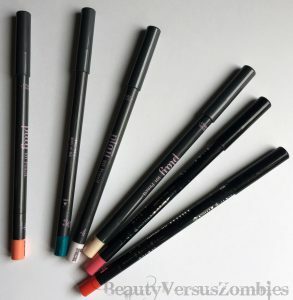 They’re a cheap and easy way to try out more unconventional liner colors. I will say, however, that the subsequent blending pencils were a disappointment. Tracy really liked this product, so I had high hopes for it. Generally speaking, I try and use a skincare product for at least a couple weeks before I review it on the blog, but I only used this product once. I put it on my face one night and, based on the way it burned on my skin, I washed it right off and never touched it again. I can’t tell you whether my skin was oversensitive that day (this was right before I gave up on Curology) or whether I’m allergic to something in it, but I have no intentions of ever using this again. You can purchase this from Glossier for $18. So Joan did two reviews of this product – a standalone video review here, and this product also made it into her best of beauty 2016 video with Edward Avila here. 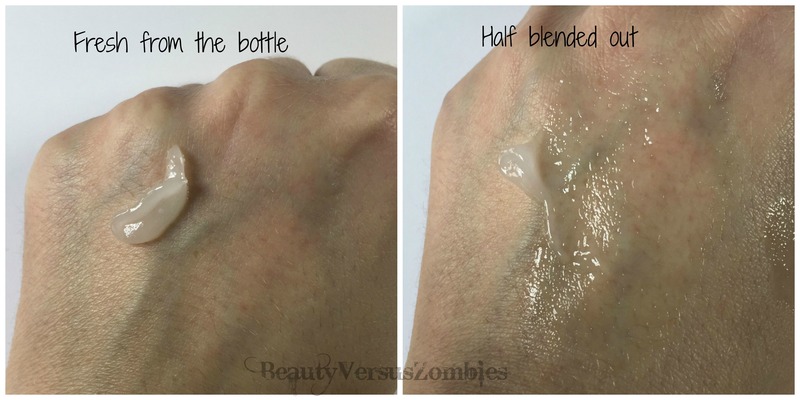 In the first video she addressed the product’s claims both in terms of makeup and skincare; in the second she simply used it as a primer. In addition, J. One is a line created by Ha Ji Won, who I watched in the K-dramas Secret Garden (2010) and The Time We Were Not In Love (2015), so that had some influence over my decision as well. I absolutely cannot use this product as part of my skincare routine. It’s just way too weird feeling. No matter where I use it in terms of skincare it doesn’t meld well with the rest of my products. When I go to apply it, it feels almost stiff and difficult to blend to begin with, and then once I get it on my face it stays tacky. I think that quality is helpful when it comes to making sure that my makeup stays on all day, so I appreciate it in a primer, but it is not something I look for in my skincare. I don’t generally use a primer, since I also don’t often wear base makeup, so that makes this product a dud for me. Ingredients (from Sephora website): Water, Polysorbate 80, PEG-150 Disterate, Niacinamide, 1,2-Hexanediol, Rosa Damascena Flower Water, Rosemary Leaf Water, Chamomile Flower Water, Yeast/Fermented black tea extract, Imperata Cylindrica Root Extract, Nuphar Luteum Flower Extract, Sea Daffodil Flower Extract, Glycerin, Adenosine, Hydrolyzed Hylauronic Acid, Dipropylene Glycol, Sucrose Distearate, Cyclopentasilxane, Butylene Glycol, Dimethicone, Hydrogenated Lecithin, Dimethicone/Vinyl Dimethicone Crosspolymer, PEG-8, Hydroxyethylcelluclose, Potassium Sorbate Palmitoyl Tripeptide-5, PVP, Fullerene, Carbomer, Disodium EDTA, Phenoxyethanol, Sodum Benzoate, Citric Acid, Dehydroacetic Acid. You can purchase this at Sephora, on GlowRecipe, and on Memebox, all for $42. So that’s what I’ve purchased “under the influence”. Have you ever purchased something on someone’s recommendation alone? How did it end up for you? This entry was posted in makeup, minireview, skincare and tagged review by BeautyVersusZombies. Bookmark the permalink.